Replacement every 150,000 miles or 10 years (tensioner pulley & guide pulley must also be replaced). 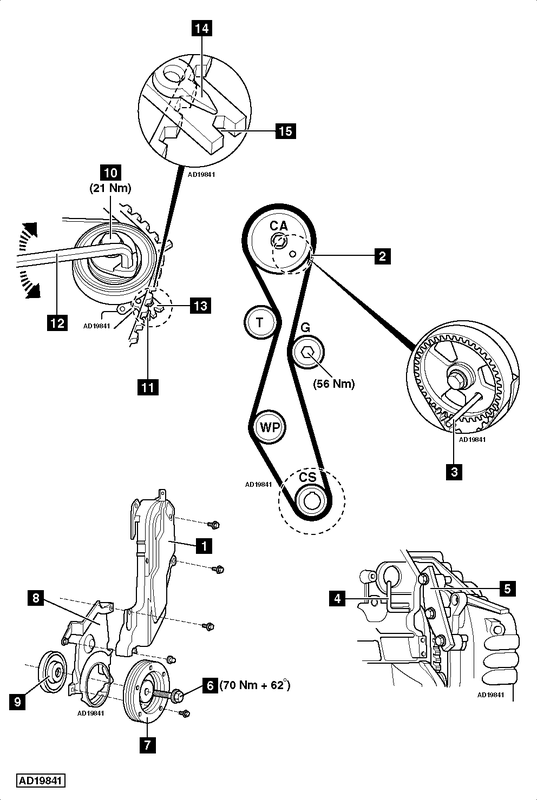 Replacement every 125,000 miles or 10 years (tensioner pulley & guide pulley must also be replaced). Camshaft sprocket locking tool – Ford No.303-735. Flywheel timing pin – Ford No.303-1059. Flywheel locking tool – Ford No.303-393. Flywheel locking tool adaptor – Ford No.303-393-01. Brake fluid reservoir from plenum chamber cover (if necessary). DO NOT disconnect hoses. Coolant expansion tank. DO NOT disconnect hoses. Turn crankshaft clockwise to TDC on No.1 cylinder. Ensure camshaft sprocket timing hole at 4 o’clock position  .NOTE: No.1 cylinder nearest to flywheel. Camshaft sprocket locking tool  . Tool No.303-735. Flywheel timing pin  . Tool No.303-1059. Flywheel locking tool  . Tool Nos.303-393/01. Disconnect crankshaft position (CKP) sensor multi-plug. Reluctor  .NOTE: Ensure reluctor is not damaged. NOTE: DO NOT refit used belt. Engine must be COLD when installing belt. Ensure flywheel locked with tool  . RH engine mounting bracket. Tightening torque: 56 Nm. NOTE: Ensure arrow on belt faces direction of rotation. Fit new tensioner pulley. Finger tighten bolt  . Ensure belt is taut between sprockets. Turn tensioner pulley anti-clockwise until pointer in position as shown  . Use Allen key  .NOTE: Tensioner pointer to left of notch in baseplate  . Tighten tensioner pulley bolt  . Tightening torque: 21 Nm. Crankshaft pulley bolt  . Use old bolt. Tighten crankshaft pulley bolt  . Tightening torque: 50 Nm. Turn crankshaft slowly four turns clockwise. Ensure camshaft sprocket timing hole at 4 o’clock position  . Ensure camshaft sprocket locking tool can be inserted  . If locking tool cannot be inserted: Repeat installation procedure. NOTE: Ensure reluctor is not damaged. Hold tensioner pulley. Use Allen key  . Turn tensioner pulley until pointer aligned with notch  &  . Tighten crankshaft pulley bolt  . Use new bolt. Tightening torque: 70 Nm + 62°. Install components in reverse order of removal.NOTE: If battery has been disconnected, re-initialization of window motors may be required.